Объявлено второе обновление стабильного дистрибутива Debian 6.0 "Squeeze". Всего апдейт содержит 64 заплатки безопасности и багфиксы к 73м пакетам. Новые образы CD и DVD, содержащие обновленные пакеты, будут доступны в ближайшее время. You guys are making it difficult for me again, this week there were a lot of great posts from the community and it was hard to pick just 5 posts. Andy Grant - Some Answers About Queues: LUN and HBA Queue Depth on ESX(i) Hosts - his article is in response to the post More Questions About Queues: LUN and HBA Queue Depth on ESX(i) Hosts. I previously posed a few questions about the behavior of vSphere’s SIOC and (LUN) Adaptive Queue Depth algorithm and have a few observations to report. Отметь День системного администратора в Одессе! С 28 по 31 июля команда компании RootUA Media приглашает всех пользователей и разработчиков свободного/открытого программного обеспечения посетить Одессу и вместе отпраздновать «День системного администратора» в рамках Odessa Summer FOSS Fest 2011. Место проведения — закрытая территория учебно-тренировочной базы альпклуба «Одесса» на берегу Чёрного моря, где будет разбит палаточный лагерь. Программа Odessa Summer FOSS Fest 2011 — общение на профессиональные темы, здоровый и приятный отдых у моря. По желанию участники ивента могут проживать в палатках или в гостинице Скалодрома, которая расположена на территории проведения Fest`а и в нескольких метров от моря. Организационный взнос составляет 300 UAH (38 USD). Since 2005 happens Google Summer of Code (GSoC), a program organized by Google in order to provide to the student developers, from around the world, financial support so they can develop Open Source projects. KDE has participated in the program since its inception and achieved a significant number of approved projects. This number has grown with each edition. Decided to check the history of KDE participation in GSoC to get a sense of female participation in the program. I made some graphs to represent the growing of KDE’s approved projects over these seven years and the great difference between the number of women and men. Unfortunately, women’s participation is still far below what we would like. GNOME 3 vs. Unity: A Schism in the Making? Both GNOME and KDE recently underwent massive redesigns. GNOME 2 morphed into version 3.0 with a radically different look and feel. Сегодня объявлен релиз Echoprint - свободной программы для распознавания музыки. По заявлениям разработчиков, программе достаточно обработать 20 секунд композиции для того, чтоб определить название песни и исполнителя. При этом, время сканирования примерно в 250 раз быстрее реального, то есть одна песня сканируется за полсекунды. Планируется, что Echoprint станет одним из главных компонентов свободной музыкальной базы Echo Nest. On Monday this week, something I have been working to make happen for quite some time finally happened: the appmenu Qt patch got merged in the qt/4.8 branch. Appmenu-qt is both a patch for Qt (now merged in) introducing a plugin system for menubars, as well as a plugin using said plugin system to expose menubars on DBus. This plugin makes it possible to move menubars from the application windows to a top-level panel. It has been part of Ubuntu for the last two releases where it is used to implement the top-level menubar in Unity and to provide the “Menu” button in the panel of Kubuntu Plasma Netbook. Вышла в свет первая версия SDK для разработчиков расширений веб-браузера Firefox. Сами инструменты и API появились еще два года назад в проекте Moziilla Labs под названием JetPack. Команда разработчиков веб-браузера также выпустила бета-версию Add-on Builder, позволяющего пользователям создавать собственные расширения, используя веб-среду для разработки. Add-on Builder имеет редактор кода с проверкой синтаксиса, и работает в Firefox 4 и 5. I'm so happy to be headed to Europe again, especially for this huge event. I look forward to meeting more of my KDE team, but also many Gnome developers. Next month, I'll head down to Portland again and attend both CLS and OSCON. Looking forward to that as well. I'm thinking of doing a lightning talk at CLS, and hope that that springs me forward to start public speaking again. Finally, I've Joined the Game, and am now supporting KDE quarterly. If you are using a KDE-provided platform and applications, you might join too! See Join the Game for more information. Yesterday, the VMware Service Manager 9 has released. This solution enables IT organizations to deliver service excellence in this dynamic new environment with predictive problem resolution, real-time collaborative Knowledge Management, easy-to-use workflows, seamless integration with existing infrastructure and a powerful federated CMDB. В этой статье я хочу рассказать о том, как сделать загрузочный (спасательный) диск из обычной flash-карты, которые у многих лежат без дела и люди не знают куда их приспособить. Ниже будет представлен один из вариантов использовать эти носители как реаниматоры. В девичестве проект был известен под именем "hosted". Изменения перебазированы от ветки master из Xorg. Обновления, связанные с изменениями в Wayland. Переписан код системы ввода, он теперь использует драйвера для xf86. Улучшения в стабильности, исправлены утечки и повреждения памяти. Его можно собрать (инструкция по ссылке "Подробности") и он должен работать. P.S. Интеграция идёт с обоих сторон. Тем, кто интересуется статусом поддержки Wayland-клиентов в KWin, запущенном поверх Xorg: скриншот. Тут показан Wayland-клиент, работающий в KWin (ветка kwin-wayland репозитория kdebase/kde-workspace), обёрнутый в декорации окон из KWin. У него работает поддержка ввода. This is the basic feature without which ownCloud isn't particularly useful. Luckily, it's also the feature that works best and has had the most testing. 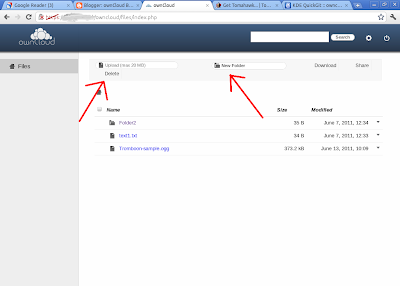 Here's a screenshot of the web interface, which is the first method most people will use to add files. Notice the upload and new folder buttons. VMworld 2011 is only 10 weeks away and you don’t want miss out. For many reasons, including the ability to learn about the latest VMware offerings and see solutions from over 200 exhibitors in the Solutions Exchange. 1) Hear from VMware visionaries and cutting edge customers at the General Sessions. 2) Content Catalog is live - learn about the over 175 unique breakout sessions and 23 labs—featuring topics that will cover everything from virtualizing business critical applications, to scaling virtual desktop infrastructure, to unifying private and public cloud resources with consistent security, compliance and management. KDE SC (or was it Platform?) 4.7 will bring some enhancements to Kate plugins. First up is the build plugin. The new thing for the build plugin is the ability to specify multiple targets per session. This means that you can build debug/releas/… targets without having to jump between sessions. The default setup/targets contain a configure target with a CMake command and a build target that runs make. Targets can be added, copied and deleted. If the last target is deleted the default targets will be re-added. Do you find yourself saying, “This could have been better!” when using VMware.com? If so here’s your chance to help make our web site better! VMware is currently redesigning various areas of the online self-management tools, including downloading binaries, managing licenses, getting support, and managing users/permission in your organization. The team would love for you to be a critical part of this evolution of VMware. If you’re interested in helping us improve this experience, please sign up to participate in one of our virtual 1-on-1 feedback sessions by emailing us at VOC@vmware.com. We're taking the first 15 volunteers to reply. By the way, selected participants will receive an incentive for for helping us with our development. We're looking to conduct these sessions between 6/28/11 – 7/11/11. Вышла новая версия QGIS, одной из самых динамично развивающихся ГИС с открытым исходным кодом. QGIS - свободная (GPL) пользовательская ГИС, написанная на языке C++ с использованием библиотеки Qt. QGIS поддерживает практически все распространенные форматы пространственных данных, расширяется модулями на C++ и Python (уже существует свыше 150 модулей расширения). I came back yesterday from Qt Contributor Summit, which took place in Berlin from the 16th to the 18th. Richard Dale blog post about the summit provides a good summary of the plenary so I am not going to duplicate his work, instead I suggest you just go read it. They want people to get involved by providing new add-ons, but also by helping in maintaining/developing the Qt framework and tools. I've just got back from the Qt Contributor's Summit, and I had a really good time. Вышло значительное обновление MirBSD Korn Shell (mksh), добавляющее новую функциональность и исправляющее множество известных ошибок. mksh — активно разрабатываемый проект-наследник pdksh. Цель разработки — предоставить хорошую командную оболочку для интерактивного использования, но с основным упором на написание скриптов. Может работать на большинстве распространенных Unix-совместимых систем. My openSUSE Build Service project now has rpm files for Fedora 15 for the libferris chain including gevas and the ego file manager. This includes the recently mentioned updates to postgresql indexing allowing for indexed resolution of some regex queries (2ms query time on 200+k files). During the updates, I found the normal little things such as gcc being more selective about what it likes to compile and treated these cases. The main glitch I found was in the @F15/../gtk/gtkmain.h header there is a prototype which takes a "GModule *module" argument. This means I had to include gmodule.h before gtk.h to get that type in scope otherwise things failed to compile. The Fedora 15 packages have support for printing with Qt, so one can echo foo > printer://default/ or "cp" an image to the printer. Scanning support will pop up in a future build once the few tiny changes to ksane I sent in trickle through to the shipped KDE release in Fedora. Генерация: 0.237 сек. и 40 запросов к базе данных за 0.107 сек.